Audi Israhel Dominus Deus noster Dominus unus est. Xenophanes... looking to the whole heaven, says that the One is God. Denn, wie auf dem tobenden Meere, das, nach allen Seiten unbegränzt, heulend Wasserberge erhebt und senkt, auf einem Kahn ein Schiffer sitzt, dem schwachen Fahrzeug vertrauend; so sitzt, mitten in einer Welt voll Quaalen, ruhig der einzelne Mensch, gestrützt und vertrauend auf das principium individuationis, oder die Weise wie das Individuum die Dinge erkennt, als Erscheinung. Just as the boatman sits in his small boat, trusting his frail craft in a stormy sea that is boundless in every direction, rising and falling with the howling, mountainous waves, so in the midst of a world full of suffering and misery the individual man calmly sits, supported by and trusting the principium individuationis, or the way in which the individual knows things as appearance. Arthur Schopenhauer, The World as Will and Representation, Volume I, §63 [Dover Publications, 1966, E.F.J. Payne translation -- modified, with "appearance," rather than "phenomenon," for Erscheinung, q.v. ; pp.352-353]; Die Welt als Wille und Vorstellung, Band 1, §63 [Reclam, 1987, p.496]. sed in omni verbo quod procedit de ore Dei. but by every word that proceedeth out of the mouth of God. Wanaḥnu 'aqrabu 'ilayhi min ḥabli-l-warîdi. We are nearer to him than the jugular vein. but I will obey the god rather than you. Relying on the "Crushed Reed"
SAMUEL L. JACKSON: "This was divine intervention. You know what divine intervention is?" JOHN TRAVOLTA: "I think so. 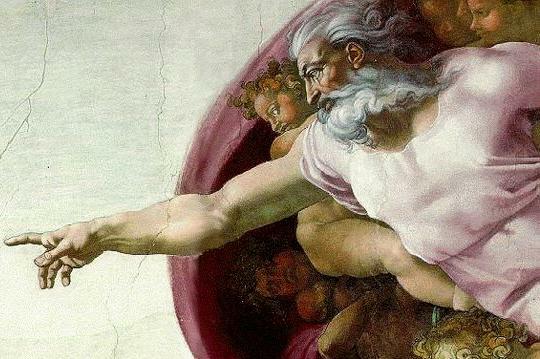 That means that God came down from Heaven and stopped the bullets." SAMUEL L. JACKSON: "That's right. That's exactly what it means. God came down from Heaven and stopped these motherfuckin' bullets." locutus est Moses ad populum peccastis peccatum maximum. Moses said unto the people, Ye have sinned a great sin. Against the rites, do not speak; against the rites, do not act. Lâ yukallifu-llâhu nafsân illâ wus'ahâ. Lahâ mâ kasabat wa'alayhâ mâ-ktasabat. for it what it has earned and against it what it has earned. per fidem enim ambulamus et non per speciem. and the evidence of things not seen. Bertrand Russell's "Why I Am Not a Christian"
Le mot religion ne signifiait pas ce qu'il signifie pour nous; sous ce mot, nous entendons un corps de dogmes, une doctrine sur Dieu, un symbole de foi sur les mystères qui sont en nous et autour de nous; ce même mot, chez les anciens, signifiait rites, cérémonies, actes de culte extérieur. La doctrine était peu de chose; c'étaient les pratique qui étaient l'important; c'étaient elles qui étaient obligatoires et impérieuses. La religion était un lien matériel, une chaîne qui tenait l'homme esclave. The word religion did not signify what it signifies for us; by this word we understand a body of dogmas, a doctrine concerning God, a symbol of faith concerning what is in and around us. This same word, among the ancients, signified rites, ceremonies, acts of exterior worship. The doctrine was of small account: the practices were the important part; these were obligatory, and bound man (ligare, religio). Religion was a material bond, a chain which held man a slave. Tell the king; the fair wrought house has fallen. The fountains are now silent; the voice is stilled. Tell the king the fair wrought hall is fallen to the ground. nor a spring that speaks. The water of speech is quenched. The Oracle at Delphi in answer to the Emperor Julian in 362 AD, or also cited as a statement to the Emperor Theodosius I, 393 AD, or to Julian by the Oracle at Daphne. The first translation is by Peter Hoyle, Delphi [Cassell and Company, London, 1967, p.142], who cites no source. The second translation is given by Michael Scott, Delphi, A History of the Center of the Ancient World [Princeton University Press, 2014, p.243, note]. ecce facta sunt nova [omnia]. Behold, all things have become new. Chinese Religion, , the "Three Ways"
Waman yuḍlili llâhu famâ lahu min hâdin. And whom God leads astray, there is for him no right guide. Where death is, religion must be. To you I'm an atheist. To God I'm the Loyal Opposition. 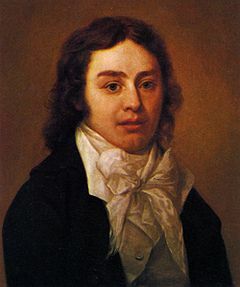 Samuel Taylor Coleridge, "Kubla Khan; or, A Vision in a Dream: A Fragment"
"Moe, a wise man once said, 'Religion's a good thing for good people and a bad thing for bad people.'" The source cited by Scott is H.W. Parke and D.E.W. Wormell, The Delphic Oracle, Volume II, The Oracular Responses [Basil Blackwell, Oxford, 1956, #476, p.194]. The Greek text is given by Parke and Wormell, with no translation, and in turn is attributed to Philostorgius, "from book 7 of the [Church] History (Berlin ed. p.77, 1.18)," with the passage repeated by Cedrenus (ed. Bekker), where Bekker evidently attests the dative singular of instead of the non-standard (or dialect) in Philostorgius. Otherwise, we seem to see Doricisms ( for Attic , "spring, fount, stream") in the text, which may reflect the Northwestern dialect of Delphi. Thus, far from having Delphi announce the end of its history, Philostorgius has it continue to prophecy, all allowed by God in order that the prophecies discredit themselves. This edition of Philostorgius, however, does not cite its primary source; and some attention is thus warranted to the "Berlin ed." of the Greek text referenced by Parke and Wormell. Treadgold then cites the source of the Philostorgius text as the Philostorgios Kirchengeschichte, edited by J. Bidez and F. Winkelmann (Berlin, 1972). This clears up the problem that the information about Philostorgius from the Bibliotheca doesn't amount to much, but it doesn't clear up how this other information about Philostorgius, quoted by Edward Walford, does not match the statement about Delphi quoted by Parke and Wormell, whose "Berlin ed." may or may not mean Bidez and Winkelmann.